Would you like a holiday away from the crowds and for a change not be pushed and shoved at?? Turin is your choice then! It is less crowded and quieter compared to the big 3 (Rome, Venice and Florence) and also more pleasant. I was in Turin in the peak season and could eat, drink and walk around without being shoved at. Exactly how a vacation should be! So visit Turin before the city gets run down by mass tourism and consider this post as one of the many posts on what to do in Turin. I cannot stress this fact enough….Turin=Bicerin and Bicerin=Turin. I refuse to have it anywhere else even if I am offered money! Until you haven’t had this heavenly drink, you won’t know what I’m saying… So go to Turin! And FYI Bicerin is a sinful combination of chocolate, espresso and milk with a touch of Turin magic! This should be added to your things to do in Turin. Museum and history lovers rejoice! Turin is a haven for all of you. There is so much to see and do in Turin, that you might find time to be short. Apart from the amazing Cinema and Fiat museums, there are also stunning palaces of the Savoy Kings and Queens to be visited. If you ever curious about an Italian food museum, don’t be now. There is one! And in my humble opinion, it’s called Eataly! You will find everything “Italian” under one roof. So imagine those tasty holiday treats that your Italian friends share or those vintage looking candy bars that you always wanted… Hunt no more… Consider going here with an empty stomach and a full credit limit! Don’t say I didn’t tell you. Read Next: 5 Things to do in Turin for Free! 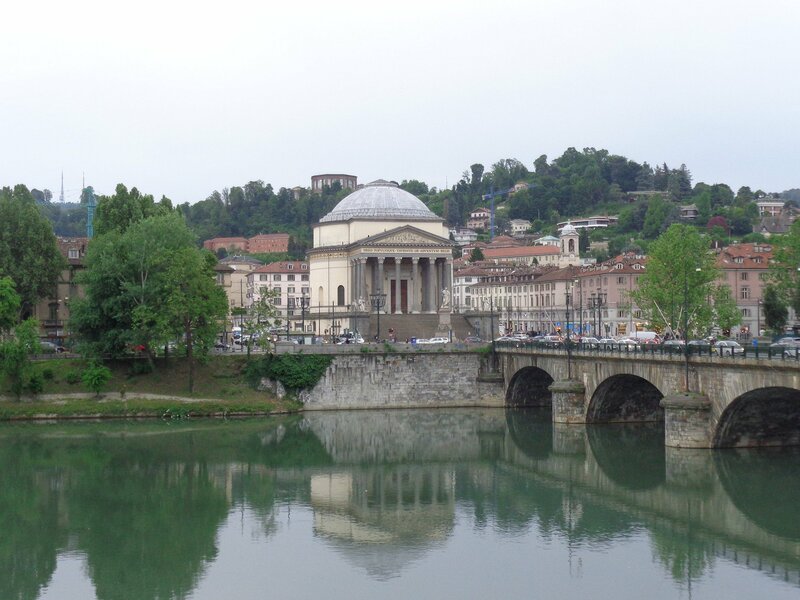 Before visiting Turin, I thought the only thing missing in the city was the water…. I was wrong. The river Po flows through the city and makes everything look scenic and romantic as it divides Turin in two. In the evening when the city lights are up, the river gives a misty element and almost make a lovely painting. Wouldn’t you add Turin to your Italy list?? 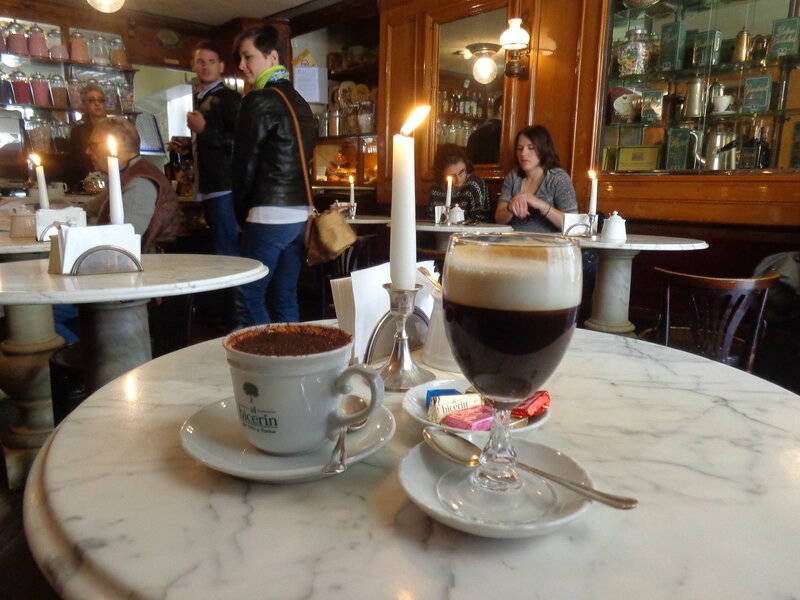 Vienna and Rome have been my top choices for cities with historic coffee shops. But now there’s one more to the list! Turin not only has excellent historic shops but also has the old fashioned vibe. Imagine furniture from the retro era and waiters serving in old bow ties….. In Turin time really stands still. The city is also the birthplace of Aperitivo. I’m not complaining. Are you??! Travel to Turin! "All this for me??" "Tutto per me??" That's what I asked on my first day here during the aperitivo. Then I got used to it 😉 Fun fact: Turin is the city where the concept of aperitivo started. In about 30 minutes you can cross Turin’s elegant city life and head to the nearest vineyard or the prettiest side of the country! 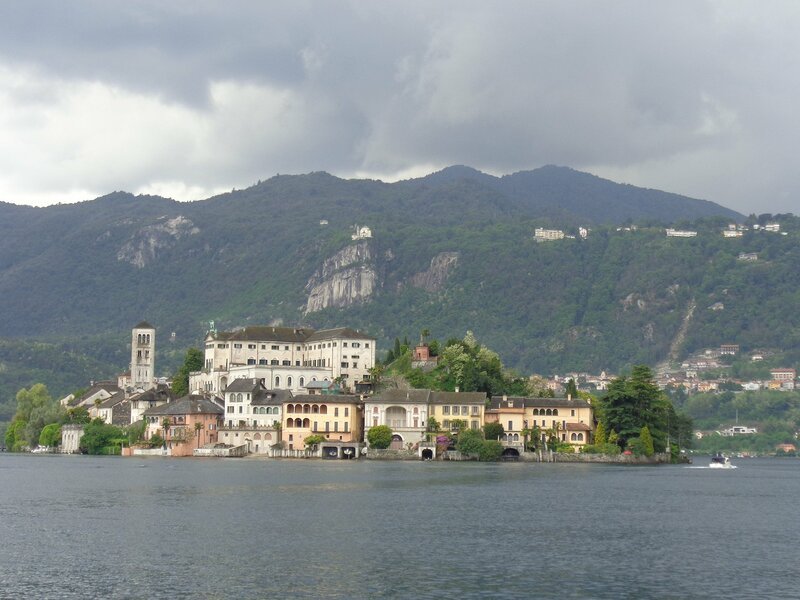 In about an hour’s drive you can reach the lakes of Maggiore and Orta that make for two stunning day trips. There’s a long list of historic towns such as Alba and Bra famous for truffles, wine and cheese. Mamma mia! Traveling to Turin is such an advantage. 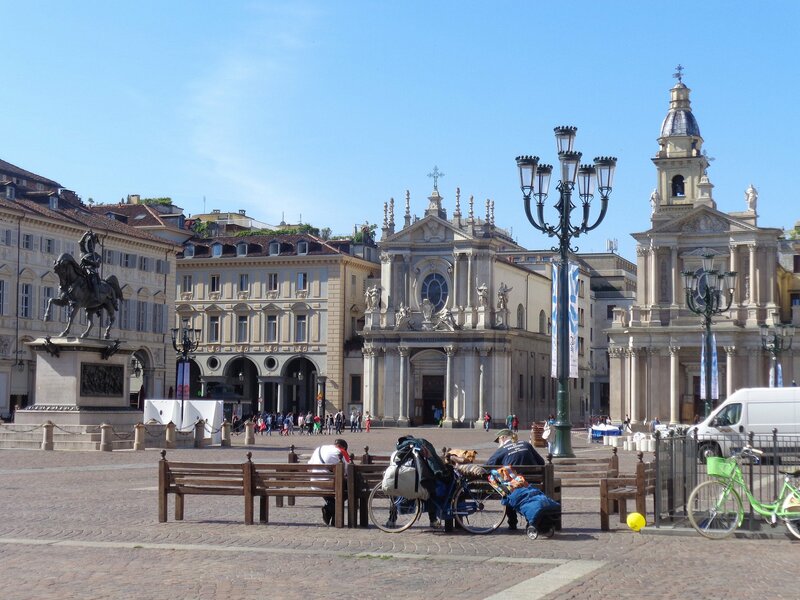 The piazze (public squares) in Turin don’t call for attention…They are elegant, chic and effortless. Add a little drama of art nouveau and baroque and that’s Turin for you. Since the city happens to be very spacious, you can possibly be the only one at a piazza even at 8-9 in the morning. There is literature surrounding the whole city as writers such as Umberto Eco, Mark Twain, Primo Levi, Italo Calvino, Friedrich Nietzsche have visited and admired the city. It is a celebration of Italian literature to walk the same streets as the writers of the bygone eras. Additionally, Turin has some amazing bookshops. Being an avid reader and bookish traveler, I could not “not” visit Turin’s bookshops. There are plenty on Via Po. And oh did I mention the book fair Salone del Libro?? It happens in May every year! Definitely visit Turin. If historic stores and old world cafés aren’t enough for you, the city is also filled with vintage trams. There is a healthy mix of old and modern as a metro line connects the newer parts of the city. I, born an old soul, avoided the metro and loved hopping in different trams….Sometimes even without a reason. ~Afterglow~ I think I have a thing for cities with trams 🤔😄🚃😬 do you too?? So are you sold to visit Turin?? 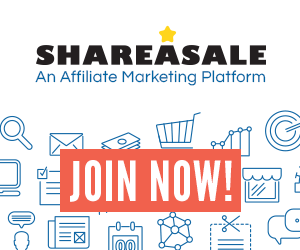 Disclosure: There are “ affiliate links” on my blog. If you click on a picture and make a purchase through these links, I will receive a small commission (at no cost to you). Thanks for supporting Italophilia! GET YOUR 3 DAYS IN ROME PDF! I’ll check it out after dinner. Thank you! Love, love, love this post! I’ve lived in Italy for nearly 4 years now and still advent got to Torino yet but reading your post makes me want to get there ASAP! Aw thank you Amber! I’m happy you enjoyed it. Wonderful post! Can’t wait to go now! So happy that you want to! I don’t live too far from Turin though it took me a while to getting around to visiting it. It’s a delightful spot, wholly underated. One of my favorite cities and you have captured it beautifully! 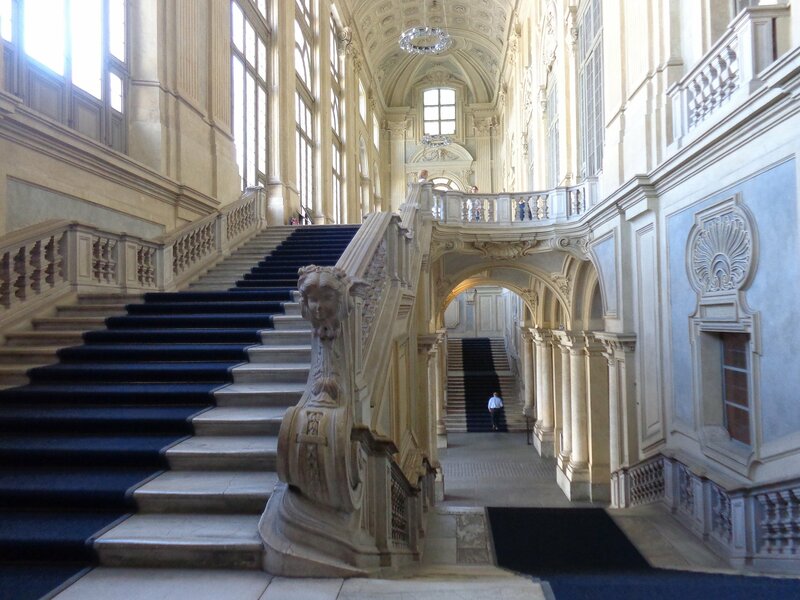 I loved visiting Turin! It simply has it all: culture, lots of tourist attraction, amazing landscape, and as you said, not as crowded as other cities from Italy. One of my favorite places in Turin was Basilica Superga, from where you can have a gorgeous view of the whole city. What a great reminder of everything that’s wonderful about Turin. I’ve been once and would love to go back. I’d definitely agree with you on the Bicerin even though I’m not normally a coffee drinker. I’d add a few things to your list including the fabulous Roman era ruins (the Porta Palatina city gate is stunning) and the Archaeology Museum (accessed via a ticket to the Musei Reale) which has some wonderful Roman era finds including the Marengo Treasure. Fans of the Italian Job film should visit the Agnelli Gallery situated on top of the Lingotto shopping centre on the site of the old Fiat Factory. Handily that’s also near Eataly. I’m not a car fan as I don’t drive, but the National Auto Museum had some amazing exhibits. And further afield, we had a great tour (in Italian) of the Savoy royal tombs in the stunning hilltop Basilica of Superga. And Stupinigi’s royal hunting lodge (palazzina di caccia) is well worth a little trip out of town. Thanks dear! Your tour of the tombs sounds very interesting I’ll check it out next time. Thanks for all the points .. It was a choice between that or a tour of the basilica’s royal apartments. As this was starting sooner we went for it, but really interesting to understand more. You have chosen your reasons very well. I quite agree torino is dpecial. Fantastic post. I have added Turin to my list! Well, looks like I need to go back to Italy. 😉 Looks great! OK, now Turin is on my list. My job is done! How far are from you from North Italy? I’m keen to get to Torino one day- missed out this year. And I love cities with trams. Next time I hope. I feel I didn’t even scratch the surface! Italy is always like that. I just booked a trip to Turin in March! I will definitely check these places out. I’m coming …😍🤣 I love trams! You make a compelling argument. It’s on my list. My beautiful hometown 🙂 Grazie! Turin is so underrated and little known but its an absolute gem. I loved it and love your post Ishita, grazie! You are so right. For some reason, Turin has not been able to capture the world’s imagination, but it represents some of the best Italy has to offer. Look for a reblog of this post next year! Reblogged this on Conversational Italian!. What a fantastic review of my hometown! I am really glad to see how much you’ve enjoyed it. There are many reasons behind the fascinating appeal of this city one of them is indeed the fact that Torino has been the very first Capital city of Italy (the Italian kingdom at that time). Thanks for this great post! I am so happy to see someone writing about Turin! It is not a popular choice among travelers, but should be. It is an elegant and amazing city indeed! Thanks so much 🙂 happy you found it so. Buona Pasqua! I’ve travelled through Turin airport countless times but I’ve never made it to the city centre to explore. It looks incredible! And I adore aperitivo, I can’t think of anything better than sipping and Aperol spritz in Turin. If you fancy an alternative day out from the city centre, try taking a train up to the nearby Susa valley – it’s closer than the lakes and the mountain towns and resorts here are just beautiful. I hope you can visit next time!! The Susa Valley was missed both times because I traveled to other parts around Turin. That being said, its on my mind. And you will love the Bicerin in Turin! I’m originally from Pakistan. I did my BS and MS from turin and start working in turin. It is almost 7 years i’m living In turin never get bored . I traveled a lot. Visitled so many places. I would say there is no city like turin for living. How cool, Usman!! I can imagine. Turin has everything and is even close to the sea.